It’s the most wonderful time of the year – Moab! 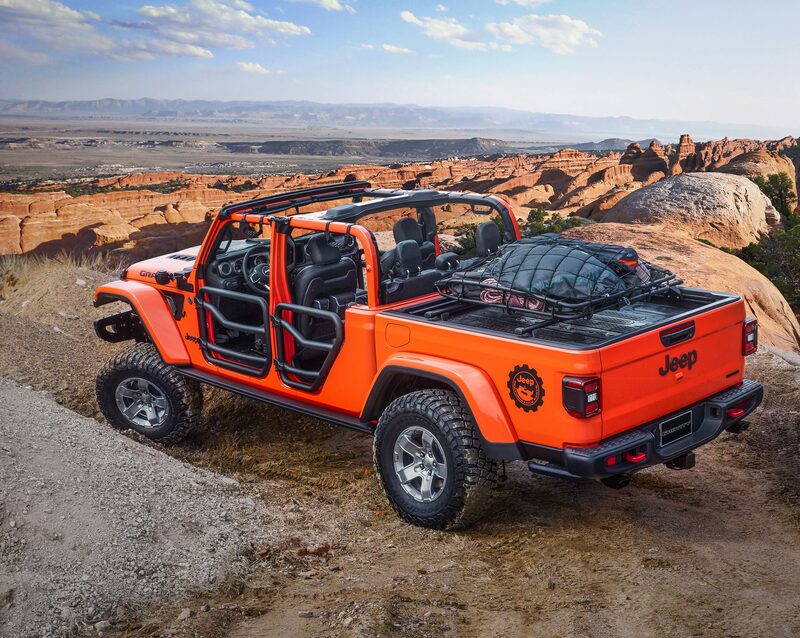 With the Jeep Gladiator soon to hit showrooms across the nation, the brand went all-in on concepts with truck beds at this year’s Easter Jeep Safari in Moab. No fewer than half a dozen pickups ranging from mild to wild were unleashed by the Jeep crew earlier today. 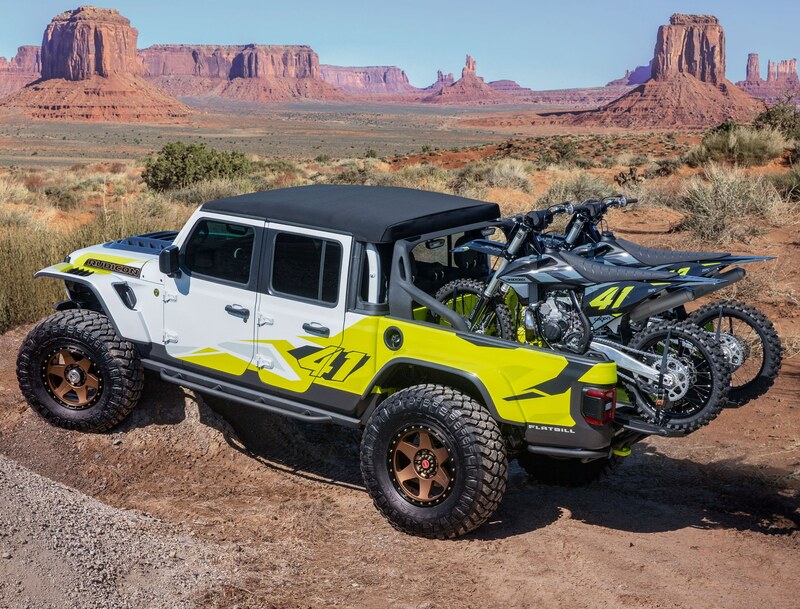 This ride is a Rubicon customized to a two-door configuration and arguably one of the concepts that could easily make production. A six-foot cargo bed area (don’t call it a box) is a full foot longer than the standard Gladiator bed. The design team reached back into the archives for its custom Metallic Brilliant Blue paint, calling to mind a shade that showed up on the 1978 Honcho. 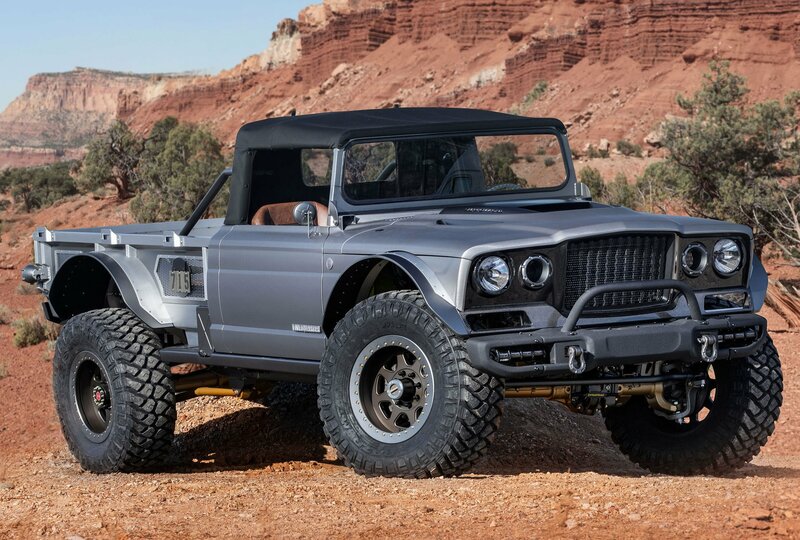 The J6’s overall length is 201 inches, with a wheelbase of 118.4 inches, matching the wheelbase of the current-generation Jeep Wrangler 4-door. This is great news for production possibilities. A prototype two-inch steel stinger bar bolts to the Rubicon front bumper, while rock rails customized with two-inch steel tubes welded to the standard Jeep Gladiator rails. We love that retro font on the front fender badges but could easily do with all the accessory lighting. Those are 37-inch tires, by the way, and there’s a familiar 3.6-liter Pentastar under the hood. Jeep, if you’re listening, build it! Reaching back into the vaults for this one, the rig shown here is a restomod of epic proportions. Starting with a 1968 M-715, this Gladiator-based military vehicle was re-imagined with design and functional improvements to its chassis, drivetrain, and cargo space. The original front sheet metal was tossed in the dumpster, replaced by a full carbon-fiber front end. Give yourself a cookie if you spotted the bobbed six-foot bed and 3.5-inch shave given to the convertible soft-top. It cuts a mean stance. The M-715 Five-Quarter’s off-road capability has been jacked by reinforcing the original frame and replacing the leaf springs with a heavy-duty link/coil suspension system. Not content to rest, the team pulled the front axle forward forward two inches, using a Dynatrac Pro-rock 60 up front and a Pro-rock 80 axle in the rear. Capping things off are massive 20-inch beadlock wheels wrapped with 40-inch tires. Under the hood? A Hellcrate engine making over 700 horsepower, of course. 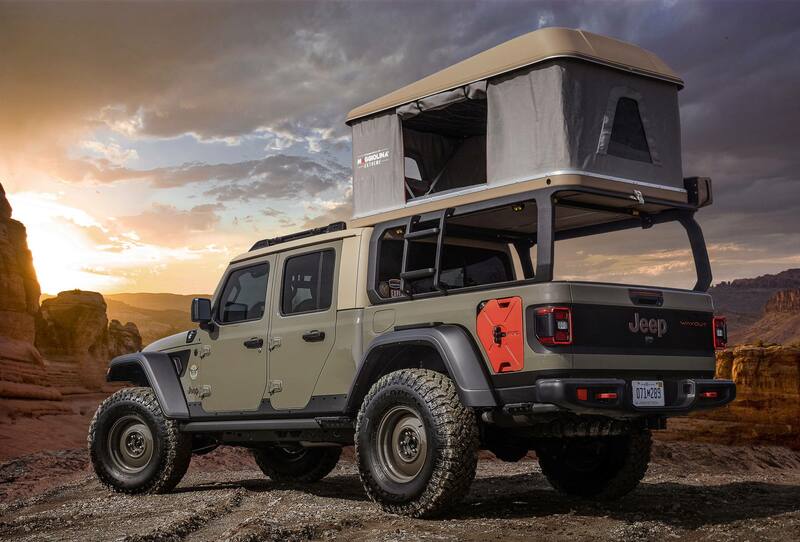 Appealing to the overlanding crowd from Moab and beyond, the Wayout shows the way out an epic rooftop tent mounted on a custom bed rack, making the most of Gladiator’s best-in-class payload rating. The body-armored exterior features a new Gator Green color that will be available on production Gladiator models. There are a couple of auxiliary fuel tanks for long overlanding drives and an ARB on-board air system in case things get really gnarly. 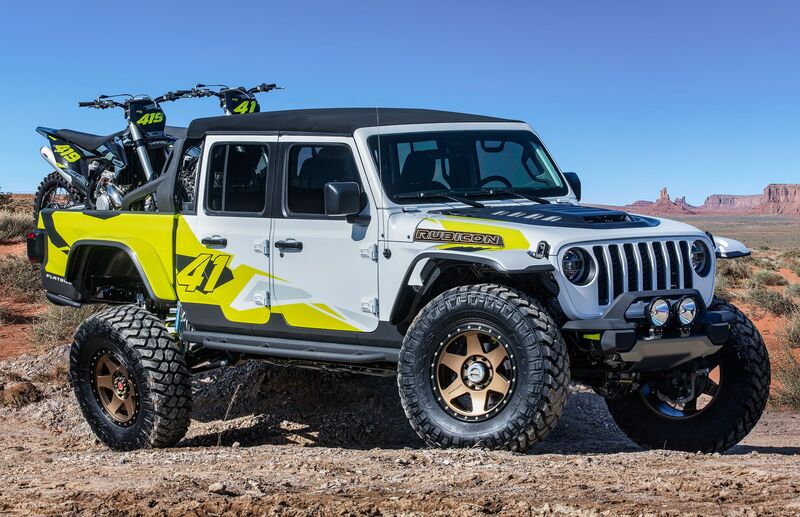 A two-inch lift kit plucked from the Jeep Performance Parts catalog increases ground clearance on top of 17-inch steel wheels that are hugged by 37-inch mud-terrain tires. We feel it provides a distinct retro feeling harking back to the original Willys pickups which paved the way for modern Jeep trucks. For good measure, a 12,000-lb. Warn winch and Jeep snorkel are also installed. Designed with the motocross community in mind, the appropriately named Flatbill mixes some custom parts with a good dose of gear that’s available in Jeep’s aftermarket catalog. A set of dedicated wheel ramps slide out of the bed for easy loading of two-wheeled bikes, and a custom-designed shortened front bumper improves its approach angle compared to a stock Gladiator. Dynatrac Pro-Rock 60 front and rear axles, plus an Off-Road Evolution custom four-inch lift kit, help the Flatbill tackle trails on the drive to motocross action. 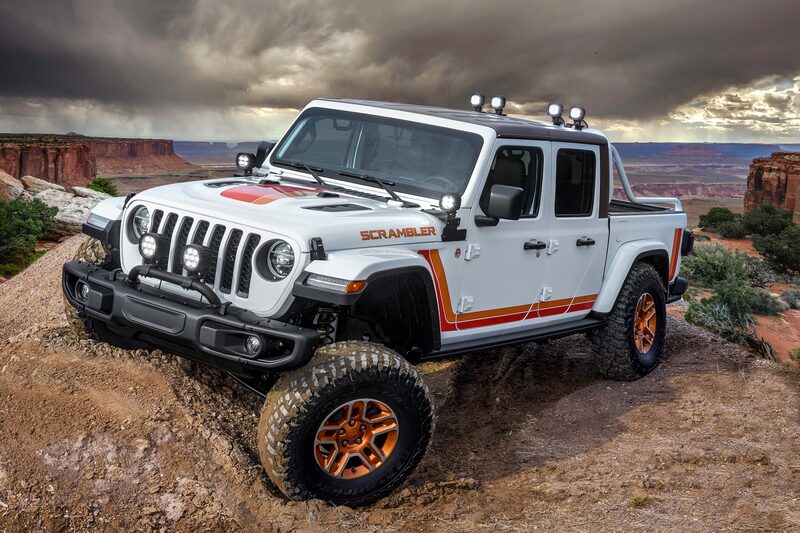 Large rear bypass shocks and 20-inch wheels have been added, the latter wearing a set of 40-inch tires, which Jeep claims is the first time tires of that size have been fitted to a Gladiator. That the power of Moab, folks. Powering all this is a Pentastar V6 equipped with a cold-air Mopar intake and mated to an eight-speed automatic transmission. 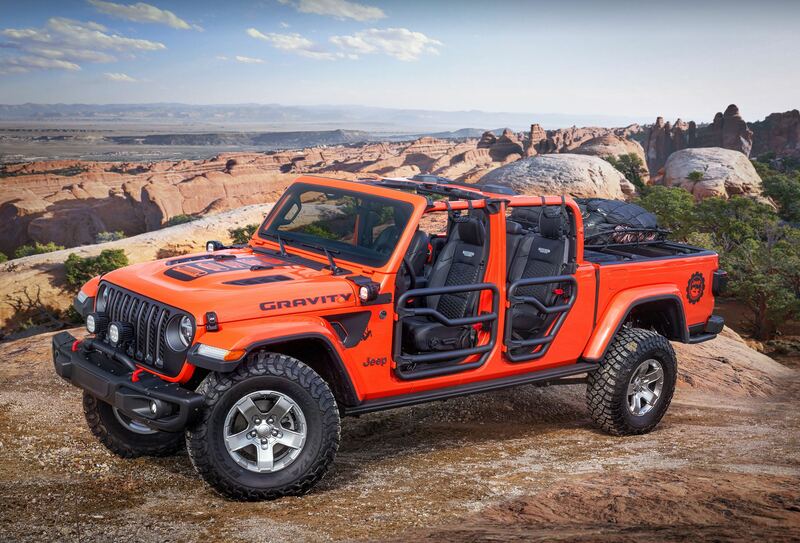 Purely an exercise in adding kit, the Gravity simply said “yes” to the entire Jeep Performance Parts catalog. 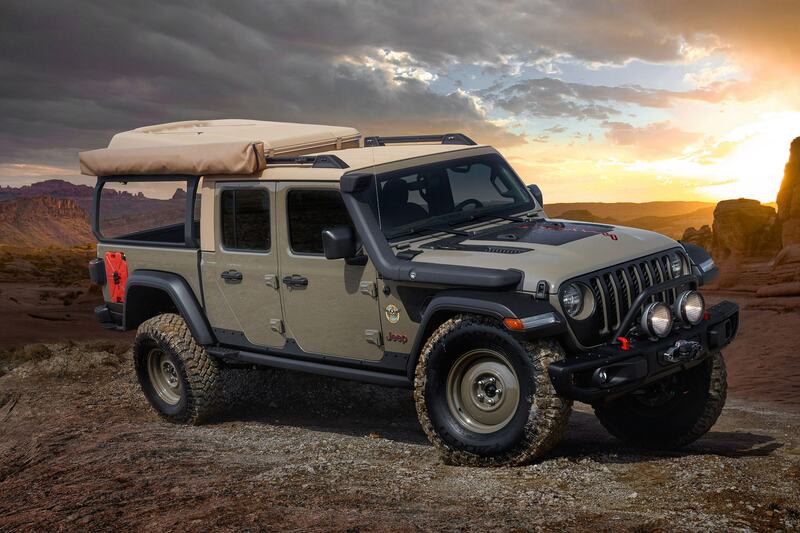 A Rubicon model, it wears Mopar cross rails which work in concert with a cargo carrier basket to deliver storage space for rock-climbing gear. The two-inch round steel tube doors look fantastic, are available in the parts catalog, and allow for open-air driving without the truck’s namesake doing a number on your noggin. Underneath one will find a two-inch lift kit running on 17-inch wheels carrying 35-inch tires. Heavy-gauge steel rock rails are thicker and wider, utilizing the same powder-coating as found on Ram Truck bedliners to provide a non-slip finish. Engine displacement goes unmentioned but it’s a safe bet a Pentastar lies under the hood, equipped with a cold-air intake and cat-back exhaust system ready for Moab. Saving one of the coolest paint jobs we’ve seen in a while for last, this Gladiator combines an awesomely retro ‘80s-era appearance of the old CJ Scrambler with kit from the modern day performance parts catalog. Those 17-inch slot wheels are out of the catalog and customized in a concept bronze to tie in with the exterior color theme. A two-inch lift kit – from the catalog, natch – helps accommodate 37-inch tires and rock rails. It’s a great looking throwback, especially with that sport light bar. Easter Jeep Safari consists of trail rides, mostly day-long trips, departing from Moab, Utah, throughout the nine-day-long event. The Jeep Safari was started in 1967 by the Moab Chamber of Commerce as a one-day trail ride but has grown to span from April 13th to 21st this year. Running footage and beauty shots of the Jeep® Flatbill from the 2019 Easter Jeep Safari in Moab, Utah. Running footage and beauty shots of the Jeep® Wayout from the 2019 Easter Jeep Safari in Moab, Utah. Running footage and beauty shots of the Jeep® M-715 Five-Quarter from the 2019 Easter Jeep Safari in Moab, Utah. Running footage and beauty shots of the Jeep® Gladiator Rubicon from the 2019 Easter Jeep Safari in Moab, Utah. Running footage and beauty shots of the Mopar vehicles at the 2019 Easter Jeep® Safari in Moab, Utah. 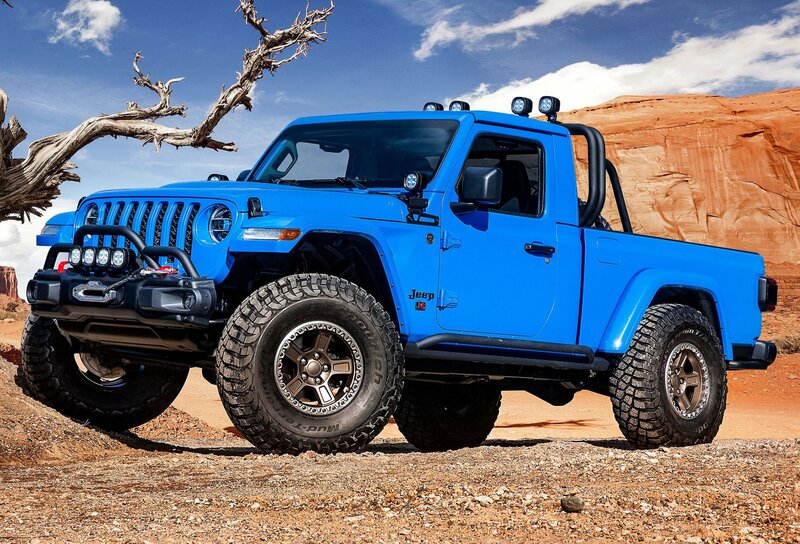 Vehicles include: Jeep® J6, Jeep® JT Scrambler and Jeep® Gladiator Gravity.